Xiaomi router is one of the three main products of Xiaomi. Since the first Xiaomi router was released in 2013, it has evolved to the fourth generation. today, Millet routers add new products - millet router 4C, pricing 99 yuan. This is also the millet router 4, after the millet router 4Q, the third millet router 4 series products. 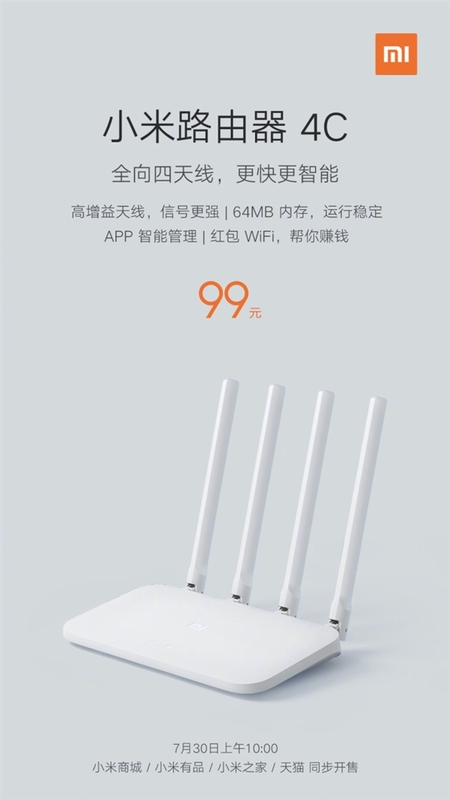 From the official pre-heating poster, Xiaomi router 4C is equipped with omnidirectional four-antenna, built-in 64MB memory, and supports APP intelligent management, red envelope Wi-Fi (shared Wi-Fi for strangers to get WeChat reward) and other selling points The detailed configuration has not been announced yet. In terms of design, the millet router 4C is close to the 199 yuan millet router 4, pure white body, the expected configuration is a simplified version of the latter, suitable for entry users to buy. It is reported that, Millet Router 4C will be at 10:00 am on July 30thIn Xiaomi Mall, Xiaomi has products, Xiaomi House, Tmall is on sale.